Last updated 09 June 2015 . By Declan Ward. 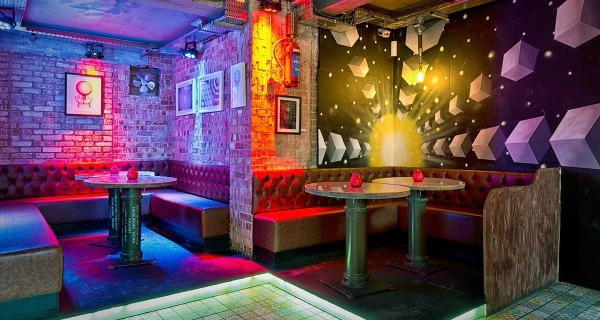 A wacky and whimsical art-inspired drinkery, Canvas Bar in Old Street is a creative cocktail cavern that catches some of the hippest hedonists and thirsty boozers in the Shoreditch pocket and beyond. Immersed in an atmospheric azure, pick up a flame-fringed thirst-quencher amongst the backdrop of quirky artwork, attractively tiled decking and up-cycled décor. By employing elements of exposed brick and lightbulb-headed taps, as well as a naked ceiling, Canvas Bar crafts an eye-catching combination of both the embellished and the industrial. Somewhat symbolic of a submarine, this laid-back lair certainly makes for a mesmerising, maritime setting to congregate with comrades and nab a few nips after work. This May, I headed here one evening to check out their “Whisky Month” courtesy of Jura and Whyte & Mackay. Book a bevvy booth and absorb that art-clad modern meets mechanical feel. Voyaging through Scotland’s Inner Hebrides down into Devon and across the pond over to America, Canvas Bar opened up the hatches to a wondrous whisky tasting and food pairing extravaganza. All sat comfortably in a wee nook, Jura whisky connoisseur engaged us on a very thorough tour through the tangs, tastes and aromas of a trio of carefully selected fine whiskeys suitably complemented by a collection of canapés. Aged in ex-Bourbon butts for 10 years on the Eastern shores of the Isle of Jura, our first whisky sample "Jura Origin", was a spicy signature scotch, mimicking the oakiness from its former barrel-home and boasting a sweet, yet mellow honey and caramel-infused flavour. Coupled with smoked salmon bellinis, the delicate fishy smokiness went down more than smoothly with this sea-salt-seasoned, Scottish beverage. 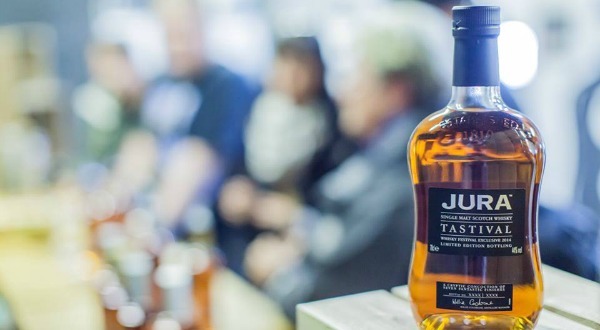 Onto the second snifter, we journeyed down to Devon as we sampled the blended "Jura Superstition" malt comprised of some of the finest young and aged whiskies. Due to the increase in barley during the brewing process, a fine fusion of peaty and smoky scents hit the senses, as well as a woody pinch of pine. Matched with a Montgomery’s smoked cheddar slice, this smoke-filled showstopper makes for a mighty mix on those cold winter evenings. Sample a few goblets of Jura direct from the island distillery and fall head over heels for whisky. Last but by no means least, 14-year-old fruity spiced, American white oak "Diurachs' Own" was a top tipple among many a tester thanks to its deep, rich and oaky tones. Since biding its two final years in ex-Amoroso Oloroso sherry casks, this whisky is full-bodied, sugary and captures a Christmassy feel. Finally and favourably coupled with dark chocolate and coffee beans, this one was no doubt a distinguishably sweet swill of premium quality. Being Sussex-born, I’m confident in saying that my whisky knowledge is pretty limited since my only previous familiarity of the liquor was a trip to an Islay distillery when I was just a nipper. However, whether you deem yourself a whisky devotee or a bourbon beginner, Canvas Bar’s Jura whisky tasting is definitely worth calling at with cronies if you’re hankering for some cheeky tasters in an artistic East London venue.